In early November, all the eyes of the power soccer world were on Paris, France as the Halle Carpentier hosted the 2011 Federation International Power Football Association (FIPFA) World Cup. 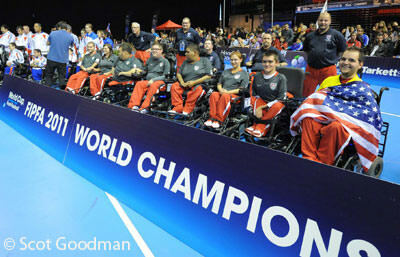 Team USA was primed and ready to defend their world championship against worthy opponents from nine other countries. In an exciting final match-up against England, Team USA emerged victorious scoring the only three goals of the game and becoming the first US soccer team to win back-to-back world championships. In true Olympic style, the opportunity to win FIPFA World Cup happens once every four years in a different city. In the 2007 contest in Tokyo, Japan, Team USA won the cup by beating France in a penalty shoot out. This focus served them well throughout the single game elimination tournament. The U.S. defeated Japan 2-0 and Portugal 13-0 in their opening games. A day later, the team fell 1-0 to England because, as Team USA player Pete Winslow put it, “we didn’t play our game and we didn’t pass.” Nevertheless, after trouncing Switzerland 21-0, they still advanced to the semifinals where they overcame France 2-0. Coupe du monde Foot Fauteuil - 2eme Demi Finale : France - Etats-Unis from ARTEI on Vimeo. Two days later on Nov. 6, they faced the Brits once again to answer their earlier upset. This time, Team USA was ready, controlled the flow of the game and, once again, brought home the title. The atmosphere was electric and the fans were out in full force. “Hearing the crowd chanting USA was an amazing feeling because we were representing our sport and our country,” recalled Winslow. Though the competition throughout the World Cup was fierce, Team USA was a pillar of determination and positive thinking. 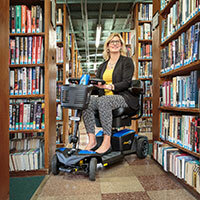 According to the U.S. Power Soccer Association, this success is due in part to their resilience and ability to manage the adversity they face in their everyday lives. 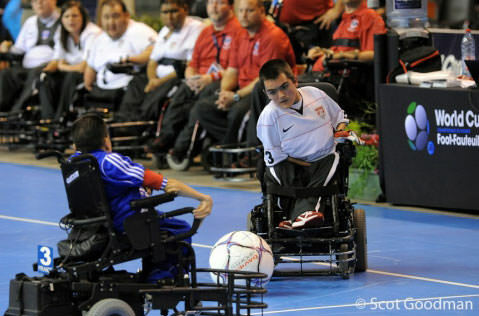 Power soccer resembles traditional soccer only, instead of using their feet, athletes push or kick the ball by deftly maneuvering their wheelchairs and foot guards. The world champion athletes of Team USA hail from all the states. Though thousands of miles apart, the following players would meet at different locations (at their own expense) to practice together and become a cohesive team. 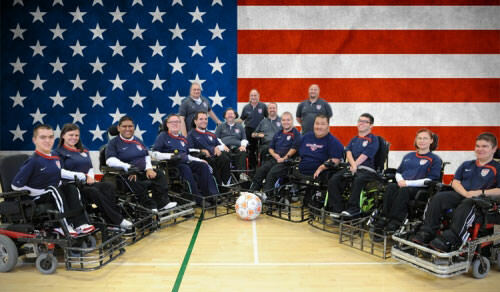 For more information about the U.S. Power Soccer Association (USPSA) or to find a power soccer team in your area, visit www.powersoccerusa.org.